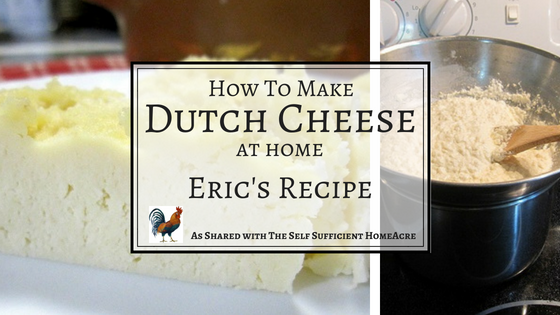 You’ve heard of Edam and Gouda, but have you ever heard of Eric’s Grandmother’s Dutch Cheese? I’m guessing not. When immigrants came to the United States, they brought their customs, knowledge, and some delicious recipes along. Unfortunately, much of this Old World wisdom and food has been forgotten. This Is One Of The Reasons I Love My Readers! Recently one of my readers, Eric from New York, left a comment with directions for making his Grandmother’s Dutch Cheese recipe. So, of course, I had to make it. Eric has given me permission to share his recipe in a post so you can try your hand at making this easy, fresh cheese too! Many thanks to Eric, for sharing his Grandmother’s recipe with us! Pour sour milk into large stock pot. Scald over medium high heat (175 degrees F) until the curds and whey separate. Place curds into top pan of a double boiler. Add baking soda and butter, stir, and allow to sit at room temperature for 2 hours. Add salt and sour cream to curd mixture and combine. Place double boiler over medium low heat. Stir frequently until mixture has the texture of a creamy, small curd cottage cheese. Pour cheese into a mold, loaf pan (or non-reactive dish) and refrigerate for 2 hours or overnight. Heating the cheese mixture in a double boiler. You may read Eric’s comments on my post Sour Milk – Don’t Toss it Out. “I just joined this blog, but am finding it as a great resource for sharing old family recipes. Love this! 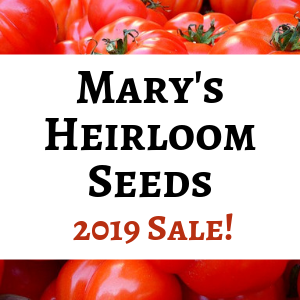 My Mother is Swedish, and my father is of Italian/Austrian mix who come from Pennsylvania Dutch country, so between them and the grandparents we have such a vibrant selection of recipes, many from the older farmsteading generation. 2 Gallons Sour Milk, 1/2 cup unsalted butter (sweet cream or cultured), softened, 1 1/2 tsps. of baking soda, 2 tsps natural salt (DO NOT USE IODIZED TABLE SALT), 1 cup sour cream. The family used homemade s.c., but store version should work fine (check for salt-free content). 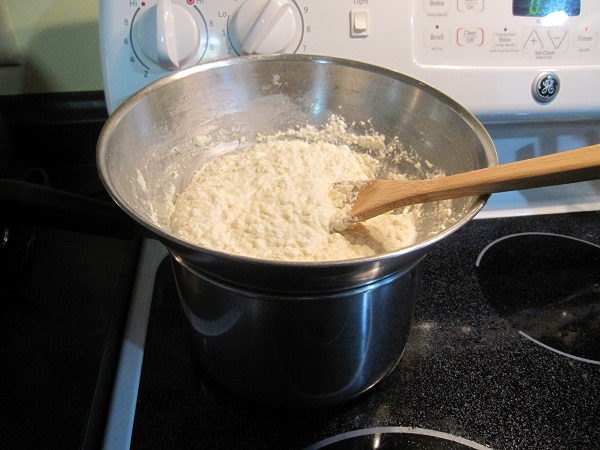 -After placing curds in bowl, add soda and softened butter, combine well, and just let sit for 2 hours. “This is a delicious cheese, perfect with wine and bread. It is also delicious used in recipes, omelettes, in a vegetable bake or even a lasagna bake. At the time my grandparents made this recipe they would use ‘Dairy Salt.’ Which was [is] a thing. It was a Non-Iodized, pure flaky salt. I have never seen it in modern circumstance in the U.S., but the best substitute is pure Kosher, or Natural, flaky Sea salt. The table salt we know from grocery stores will not allow it to set or age properly. “…It will look like Farmer’s cheese or Topfen or Quark. This was an Austrian recipe she brought to America with her, not necessarily common to Pennsylvania Dutch, though that may all be relative considered how when we settled in America, our forebears’ recipes sometimes defined a region. Topfen cheese was also a popular recipe for my (Austrian) grandmother, and I think this was a variation on that. 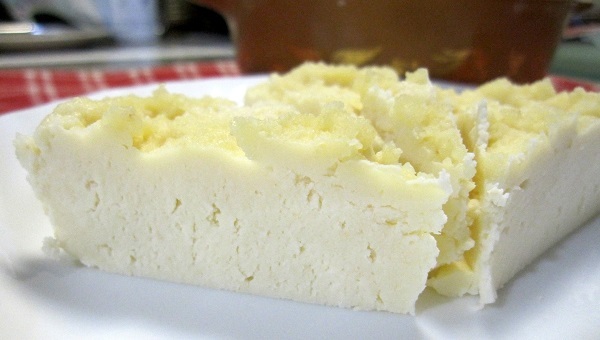 Topfen used buttermilk, this used sourmilk. “…Regarding background, I know it was a recipe brought to America from my Austrian Grandmother. She named it Dutch Cheese, which I think came from one of her ancestors from the Netherlands area. Sadly never questioned it. She also made Topfen cheese, which is a similar cheese but made from Buttermilk, and my maternal grandmother (German/swedish descent) made Quark cheese. Many neighbors made similar cheeses, and all claimed theirs was better than the others, so I would say it was more regional to their home country rather than Pennsylvania itself. I hope you get a chance to try this cheese recipe at home and leave a comment, letting Eric know how you like it! Thank you, Lynn, for sharing the recipe with others. My family will be honored. I hope it is tried by many of your readers. I wanted to make two quick corrections that I noticed to the recipe as I posted it just for clarity. In the directions for the recipe where it states to add soda and butter to curds, I wanted to add that the butter should be sweet cream or cultured, but unsalted, and softened to room temperature, and that the ingredients should be mixed in when added. I’m sure this is obvious, but just in case. Please enjoy the recipe everyone. Thank you for the clarification, Eric…I’ll make those changes.